An estimated 2.3 million people suffer with depression in the UK. World-wide that figure is estimated at 340 million. Pharmaceutical companies claim to have the cure that can lift your depression. The Medicines regulators, the body that regulate the drugs manufactured by pharmaceutical companies, main aim is to protect the public from unsafe drugs. In 'The Evidence, However, Is Clear' patient campaigner, Bob Fiddaman, highlights that all is not what it seems with the UK regulatory system. He believes that not only the public are being kept from the truth with regard to antidepressant drugs but doctor's are too. Bob Fiddaman was born in London in 1964, the youngest of three children to his parents, Douglas and Teresa Fiddaman. In 1967 his parents moved to Birmingham where he has lived since. Bob married in 1987 but divorced in 2006. He has three children, Danny, Marc and Gary. He is currently unemployed but previously held down jobs at Land Rover, Solihull and the Royal Mail in Birmingham City Centre. In 1999 Bob became the Poetry Slam Champion of Birmingham, beating a teacher of poetry in the final. Although unpublished, much of his work can be seen on the Internet. 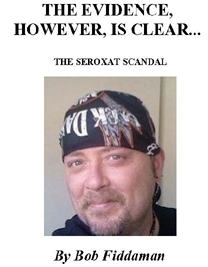 In 2006, Bob created the SEROXAT SUFFERERS STAND UP AND BE COUNTED blog. To date he has had over 148,000 visitors and ranks in 5th place when entering the search term 'Seroxat' into the Google search engine. Bob has met with the UK Medicines regulator [MHRA] on a number of occasions but has now ceased contact with them. On Friday the 7th of April, 2006, I began what I thought at the time to be a mini protest against the Medicines Healthcare products and Regulatory Agency [MHRA] and the second largest pharmaceutical company in the world, GlaxoSmithKline [GSK]. The world of blogging  was new to me but it seemed a good outlet to get ones voice heard and a short way to cut through the red tape that exists at government level here in the UK. I wasn't happy with the way an antidepressant called Seroxat, manufactured by GlaxoSmithKline, was being widely prescribed and its serious adverse side-effects were being largely ignored by both the medical profession and the UK Medicine regulator, the MHRA. The MHRA was founded in 2003 by merging the Medicines Control Agency (MCA) and the Medical Devices Agency (MDA). The MCA was created by the UK Medicines Act 1968, in the wake of the thalidomide disaster. The thalidomide tragedy occurred over fifty years ago, when it came onto the market. The years that followed saw it causing serious deformities in children whose mothers had taken the drug during pregnancy. Many of them died. Both the pharmaceuticals industry and legislators learned lessons from this tragedy. The safety tests that a new drug is required to undergo before it can be administered to humans were made much more stringent... or so we were led to believe. A blog (a contraction of the term weblog) is a type of website, usually maintained by an individual with regular entries of commentary, descriptions of events, or other material such as graphics or video. Entries are commonly displayed in reverse- chronological order. 40 years on and prescription drugs are still slipping through the system and into the bloodstreams of humans. Some would say that the whole Seroxat scandal is on a par with the thalidomide disaster. I would suggest, with respect, that it is far worse than that, worse because we actually have a regulator in place who has ignored the pleas of patients, articles and even doctors that have claimed Seroxat has ruined their lives or the lives of their patients. Of course, the fact of children born with abnormalities is far worse than those suffering withdrawal; those poor children were dragged into this world with defects, it is because of them that we have a drugs regulator in place. The Seroxat scandal should have been quickly nipped in the bud by the regulator, instead the denial continues and patients still suffer. This is what sets it aside from the thalidomide disaster. We have people in place to help us and they are clearly not. Emails to the CEO of the MHRA, Prof. Kent Woods were being ignored. Freedom of Information requests [FOI's] to the MHRA were being returned to me with exemption rules and/or a vagueness that defied belief. Something just didn't sit right with me. My suspicions regarding the MHRA and their closeness to the pharmaceutical industry stemmed from a documentary aired on BBC TV almost two years before I started blogging. BBC's Panorama  had already aired two programmes regarding Seroxat and their third, 'Taken on Trust', delved deeper into how prescription drugs are regulated in the UK. The programme's investigative reporter, Shelley Jofre, exposed huge failings in the MHRA and revealed how patients' lives had been put at risk. It focused on one drug, a drug whose controversy was rising daily here in the UK. That drug was GlaxoSmithKline's Seroxat.